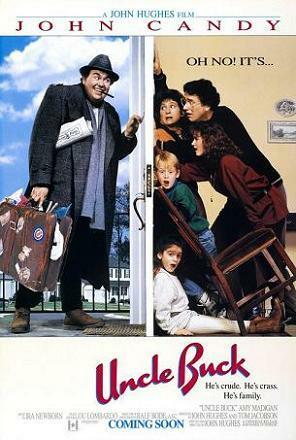 Uncle Buck is a 1989 comedy-drama starring John Candy, Amy Madigan, Jean Louisa Kelly and Gaby Hoffmann, and co-stars Macaulay Culkin, Jay Underwood and Laurie Metcalf. The movie was written and directed by John Hughes. It received a PG rating from the MPAA and a 12 rating from the BBFC. John Hughes claims that the scene wherein Macaulay Culkin speaks with Amy Madigan through the mail slot in the front door was what gave him the idea for Home Alone. The film was shot almost entirely on the campus of New Trier West High School in Northfield, Illinois. The house set was constructed in the gymnasium. The piano music at the beginning of the film is by Hugh Harris, it is taken from his 1989 song "Rhythm Of Life"; the full song is played at the end of the film.